from WHO'S WHO IN AMERICAN AERONAUTICS, 1925 ABBEY, EVERS, 1ST Lieut., Air Service; Born, Hartford, Conn., Feb. 1, 1895; son of Herbert Clifton Abbey and Mary E. Abbey. Educated: Public and high schools of New York City; 1914-1916, New York University, M. E.
Professional: 1916-1917, Assistant Director, motion pictures. Aeronautical Activities: School of Aerial Photography, Fort Sill, Okla., 1917-1918; School of Aerial Photography, Cornell University, 1918; C.O. Aerial Photo Sec. No. 31, 1918; C.O. Aerial Photo Sec. No. 39, 1919; Border Patrol 1919-1921; C.O. 1st Photographic Section, 1919-1920; Aerial Mapping Detachment, 1920; C.O. 2nd Photographic Section, 1921; School of Aerial Photography to date. 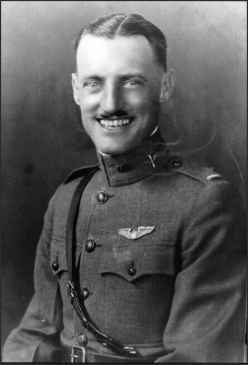 Present Occupation: 1st Lieut., Air Service. Address: France Field, Canal Zone; home, 316 West 102 St., New York City. The date of his death is unknown.